It seemed fitting that a newly-crowned Olympic gold medalist was on the front line, coaching our future Olympians at the September 5 DHL Sprint School in Newport. Guest rider Jamie Staff has had some of the best tuition possible since his late inclusion into the World Class Performance Plan from a BMX background. 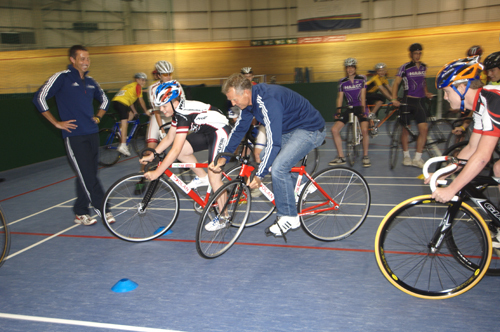 British Cycling?s Performance Manager, Shane Sutton, was also on hand to provide expert coaching to the scheme?s 12-15 year olds, with many of his tips coming straight from training guides for our Olympic riders. At each of the six schools held during the year, approximately 70 riders come down to the Newport Velodrome from all over the UK. With 21 track leagues nominating two girls and two boys to each school, they receive a fantastic cross section of riders from the length and breadth of the UK and this year over 130 different kids have attended with most coming to two or three of the schools. The DHL Sprint School has been running since February 2007, with different star riders at each school providing tips, advice and answering any individual questions the riders may have. Each school has had a different objective, which focuses on the important aspects of match sprinting and Keirin racing; riders have been taught a whole host of skills, from learning how to rush the gap to keeping an eye on their opponents. Each event also has a practical side, riders are taught the basics in a classroom environment as well as being able to take part in slow-paced skill games like ?Sumo? and ?Limbo?. The kids have certainly grasped the concept of team-work, as when Olympic gold medalist, Jamie Staff and Great Britain coach, Shane Sutton entered the Sumo ring, they were quickly ganged up upon and consequently eliminated almost immediately. British Cycling?s youth coaches, Tim Buckle and Matt Winston used video equipment so that riders could see and learn from their mistakes after the practical sessions. This technique quickly solved any problems riders had with their tactics and easily allowed them to see the error of their ways. The British Cycling team video almost all of their races and even collect footage from training sessions, this proven technique is now being moved to different aspects of the performance scale. If there?s a key to getting young riders to understand what you are telling them, it?s allowing them to put what they?ve learned into practical situations. 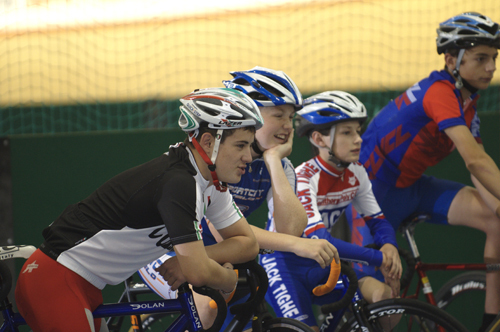 Over this season of events, racing at the DHL Sprint School has been limited whilst coaches were improving technique and teaching the necessary skills so the final school in September allowed the riders to get involved in various rounds of Keirin racing. At this level, every coach will tell you that it?s not about the winning, but at the Sprint School, this is genuinely the case. Riders can be spotted for their tactics, ability to listen, fluency, style or simply training potential. With a variety of ages present, it?s not just about who crosses the line first. Jamie Staff certainly knows a thing or two about track sprinting, and when asked if he thought there was any potential talent on the track at DHL Sprint School, he responded: ?I?ve done a few sprint schools now, and I?ve been really impressed with the quality riders and volume of riders. There are so many girls here today and that?s fantastic, I?m sure that?s down to Vicky [Pendleton]. The riders are getting the idea now and they?re not making the really big mistakes they might have done in the first couple of sprint schools. Obviously, the coaching is getting better and they?re obviously feeling a bit more comfortable on the track, it?s just really exciting to be honest, it?s making everyone?s job easier further down the road.? Shane Sutton, British Cycling?s Performance Manager, recently back from the Beijing Olympics, enjoyed his first time at DHL Sprint School, he said; ?Before I came to Sprint School, I sort of lost my appetite as far as coaching was concerned and this has just rejuvenated my enthusiasm back into the coaching element of it. “To think how far forward the kids have progressed in 6 hours, imagine what you could do with these athletes on a 24/7 basis, it?s phenomenal. A lot of these kids haven?t even done much track before, there was one kid who turned up to the track today, and had never been on the track until last night, it?s incredible to see what Guy [Elliott] at DHL has put into the sport. I think the legacy of DHL Sprint School will just go on and on.? The DHL Sprint School?s will culminate in a racing day on December 6 and season three will start early in 2009 (dates to be confirmed).